Moisture can wreak havoc and destroy your photos. This guide is about separating photos that are stuck together. I would like to know if anyone knows a way I can separate my photos, they are stuck together, side by side. 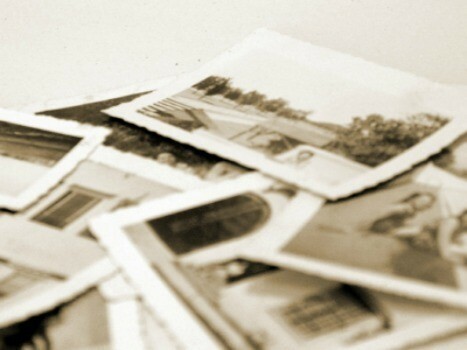 If they are photographs, NOT INK JET/LASER prints, you should put them in a tray of water at about room temperature and let them soak for at least an hour. Remember true photo paper was designed to be processed in liquid chemistry! Once they have absorbed enough moisture they should separate very easily but the image will be soft and fragile so handle gently! You could add "Photo Flo" (available at a photo stores that still sell chemical processing supplies) or a very small amount of plain dish detergent to the water. Once they have soaked they should separate easily, if they don't, DO NOT pull them apart! Add some warm water and let them continue to soak until they have absorbed enough moisture to separate easily. Dry the images by laying them FACE UP on a soft towel laid on a table or wire rack or suspend them from a string using PLASTIC clothes pins. The pictures may curl up while they are drying but the curl can be removed after they are completely dry by uncurling them and placing a heavy book or other weight on top pf them. 40+ Years as a photo processor and photographer. How do I save my photos, they are all stuck together? I read that if photos were stuck to glass to put them in the freezer for a little while, so would presume this might work here. Just so others don't spend hours agonizing over whether immersing in water will work for newer, digital camera photo prints (yes, sometimes we DO still get prints made! ), the answer is yes. At least with the type of digital prints you get from places such as Walgreens. I haven't tried any created on a home printer, on glossy or matte photo paper. I have no idea if that would work the same way or not. After a couple of days of internet research, none of which was helpful in definitively concluding that the information applied to anything other than old, darkroom-type, developer-and-fixer type photos created from negatives, I tried what I considered to be less hazardous methods, like freezing (Did NOT work. I ended up with pieces of the backs of pictures stuck to the fronts of other pictures). Then I finally decided I had nothing to lose since the photos were not useable as they were. I went ahead and put them in water (Not distilled by the way, as some sources said. Totally unnecessary). Yes, they do curl somewhat. I'm assuming that isn't an issue because remembering back to my college photography class darkroom days, curled photos do flatten. I have two photos that were stuck together when they were in a fire. How do I get these unstuck saving the image on the second picture? I've had great luck with the freezer and also a blow dryer. Two completely different temperatures. Why? I don't know. I just wanted to save the pictures. The freezer was easier and I didn't have to worry about accidentally "browning" the photos. I have 2 photos stuck together. How do I get them unstuck? I've tried freezing them and that didn't work. Any suggestions would be greatly appreciated. Pictures left in rain and stuck together! Soak them in Un-Do (aka: the scrapper's solution"). It is usually found anywhere scrapbook supplies are found. Get the largest bottle they sell and start by drizzling it over the pics, in between them. I had the same problem then I came across this website. I had nice vacation photos all stuck together, and after ripping the first few I needed to find a solution. This is what I did and it worked. Please help me get my photos un-stuck. I have them soaking in water right now, they are not separating very nicely. come apart. Read this in another tip web.